What is the Benchmark Price for Wholesale Cannabis Flower? Data is king, but in the quickly growing cannabis and hemp industry, it can be hard to come by. Establishing a cannabis wholesale benchmark has been impossible in the past. However, new data from Kush Marketplace makes it possible to see average cannabis prices. In this article we will review sales data collected from October 2018 – March 2019. This data represents a large percentage of the legal industry, but is not all encompassing. Are Wholesale Cannabis Prices Dropping? There is a lot of debate over wholesale cannabis pricing. Many believe that prices are poised to drop with industry saturation and decreased demand, but is that actually happening? Over the last six months, cannabis prices have remained fairly steady. While trim has experienced the largest swings, overall wholesale pricing seems to have level out. So, What is Wholesale Cannabis Actually Worth? To gain a better understanding of the cost of cannabis in 2019, let’s look at two specific product categories: Outdoor Flower and Outdoor Trim. Looking back to October 2018, outdoor flower has averaged around 37 cents per gram. The market capped at just under $0.45 per gram in December 2018, but declined back to normal in January 2019. The chart above has some strange signals. You’d expect Average List price to be above Average Offer Price and Average Offer Price to be below Average Offer Accept Price. As you can see, none of those expectations are true which makes us wonder what in the world is going on. The most curious month is March. We believe the reason the Average Offer Price exceeded the Average List Price is because offers on quality material are bidding up due to increased competition. This doesn’t make sense though because Average Offer Accept Price is still down. The only way we can make sense of this data is that sellers are only selling their flower for extraction material and holding on to the packagable bud because the offers are still too low. Extract buyers are probably bidding on packagable bud for extraction which would raise the Average Offer Price, but the increase in Average Offer Price still may not be a high enough price to make the deal. Share this blog post with a comment using the social share buttons on this page if you have any other insight that could make sense. How Much is a Gram of Outdoor Flower Worth on the Wholesale Market? The average cost of outdoor cannabis flower per gram is $0.35 on average for the first quarter of 2019. How Much is a Pound of Outdoor Flower Worth on the Wholesale Market? The average cost of outdoor cannabis flower per pound is $158.76 on average for the first quarter of 2019. Looking back to October 2018, outdoor trim has averaged around 8 cents per gram. The market capped at just over $0.13 per gram in January 2019, but returned to around 10 cents by February. We have seen more fluctuation in pricing for trim, but data shows that the market is stabilizing. The Average Offer Accept price was all over the place, so we decided not to include the line as it added confusion to the chart and the sample size wasn’t large enough to be meaningful. This chart makes total sense, but the one thing to note is how the lines are getting closer over the last quarter. We think there could be another crossing of these lines in April which would mean prices are going up, and we will report back if they do! How Much is a Gram of Trim Worth on the Wholesale Market? The average cost of cannabis trim per gram is $0.10 on average for the first quarter of 2019. How Much is a Pound of Trim Worth on the Wholesale Market? The average cost of cannabis trim per pound is $45.36 on average for the first quarter of 2019. 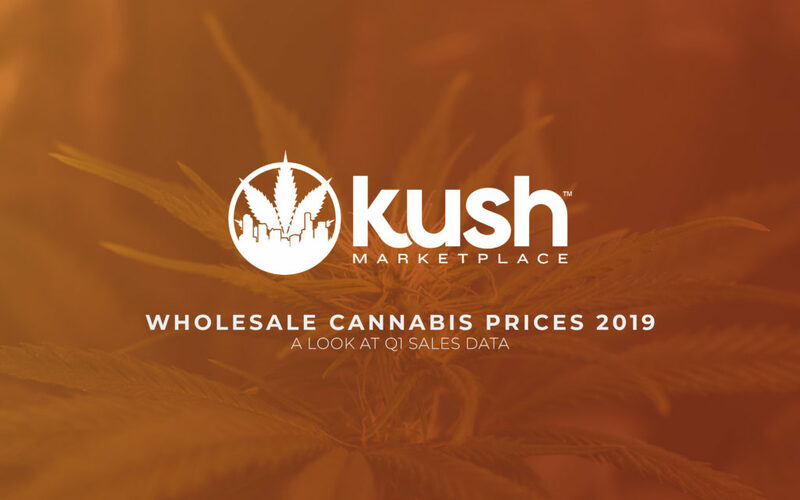 On average, sellers on Kush Marketplace receive 1.43 offers per product listed. With most listings receiving multiple offers, it makes it easy to understand the true value of your products. Kush Marketplace works with one of the largest network of buyers. We are actively searching for cannabis and hemp products.